Sweltering heat and triple-digit temperatures accompanied the Father’s Day celebrations in San Diego County. Afternoon temperatures in some parts of East San Diego County broke records at 100 degrees or higher, according to the National Weather Service. The town of Campo hit 106, while El Cajon recorded a temperature of 104, and both Chula Vista and Escondido thermometers rose to 103, said Brant Maxwell, a NWS meteorologist. Most of San Diego County experienced a heat wave on Sunday, with temps ranging in the low 80s and higher depending on the region. People are encouraged to turn off all unnecessary lights and not use any major appliances until after 9 p.m. While it’s hot this Sunday, Johnson said county residents can expect even higher temps Monday — the first official day of summer — because of an extreme high-pressure system passing over the Western United States. 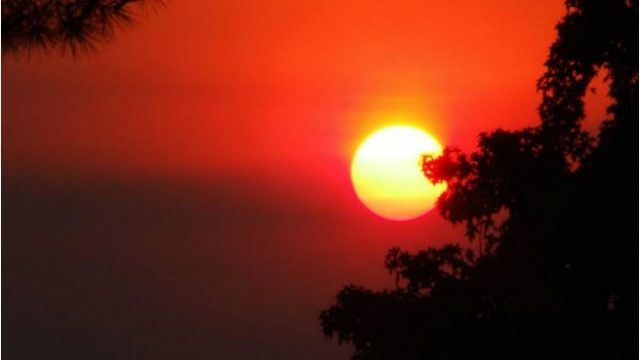 The extreme heat began Saturday and a National Weather Service excessive heat warning will remain in place until 8 p.m. Wednesday. Daily high temperatures are predicted to range from 90 to 96 degrees in the mountains to 95 to 100 degrees in the valleys to 110 to 120 degrees in the deserts. Forecasters said Monday — the first day of summer — will likely be the hottest day. And the public is advised to avoid potentially serious heat-related ailments by staying well-hydrated, avoiding unnecessary outdoor labor and checking on neighbors and relatives — especially those with health conditions and who lack air conditioning. The heat is expected to break toward the middle of next week, according to the weather service.